One of the decisive factors for achieving high value creation is the consistent monitoring of service processes with regard to deadlines, quality and costs. Efficient processes are therefore the elementary basis of your margins. Through the presentation of your company-relevant processes and via sustainable process optimisations, you can have a targeted influence upon your value creation. A clear and comprehensible presentation of your processes is required for your employees to work according to uniform processes. 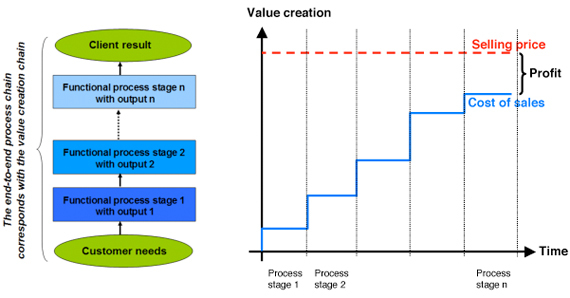 The manageability of your value creation processes is the result of clear process structures. You can thereby make your market services more targeted and efficient. Strategic company and divisional objectives must periodically be adapted to the current market circumstances. Optimisation of the processes is also required for you to be able to achieve these objectives more efficiently. Informal habits in day-to-day work change the actual processes. External influences can also interrupt a targeted and efficient process flow. It is often difficult to continuously identify and integrate these processes. Therefore, optimisation potential lies idle for most company processes. Thanks to a cross-functional and comprehensive analysis, you can identify aberrations, sub-optimal interfaces and double-tracking to optimise your processes. Again, this increases the effectiveness of your processes and thus your value creation. Where there is high cost pressure and/or low margins, you have to design your processes to be as streamlined and efficient as possible. With the targeted and continuous monitoring of quality, costs and time for each process stage, you gain an instrument for optimising your efficiency. You can therefore analyse the individual processes in detail, gain better cost transparency and define and implement optimisation measures on this basis. MAK supports you in all phases – from analysis and design to completion and implementation, to continuous improvement of your processes.